White House press secretary Sarah Huckabee Sanders explained that President Donald Trump canceled House Speaker Nancy Pelosi’s trip abroad because it would guarantee federal workers miss another paycheck, she told reporters Thursday afternoon. Trump canceled Pelosi’s trip to Brussels, Egypt and Afghanistan mere hours before she was scheduled to depart on a military aircraft. Trump justified the cancellation in a letter telling her, “I am sure you would agree that postponing this public relations event is totally appropriate,” and that it would be better if she “were in Washington negotiating with” him. The president told her she was free to fly on a commercial aircraft if she wished. Trump’s move was immediately interpreted as a swipe back against Pelosi after she disinvited him from delivering the State of the Union address at the U.S. Capitol. A State of the Union address has never been delivered during a government shutdown. Given the security concerns and unless government re-opens this week, I suggest that we work together to determine another suitable date after government has re-opened for this address or for you to consider delivering your State of the Union address in writing to the Congress on January 29th. Sanders dismissed the idea that the White House was making a petty political move telling reporters that if Pelosi had left on her trip it would have guaranteed that federal workers would miss another paycheck because she would not be in Washington to negotiate with Trump. Nearly 800,000 federal workers have already missed a paycheck as the Federal Government remains partially shut down amid a dispute between Democrats and the White House over border wall funding. The White House has delivered several offers to Pelosi and Senate Minority Leader Chuck Schumer to end the shutdown, but they have been rebuffed at every turn. 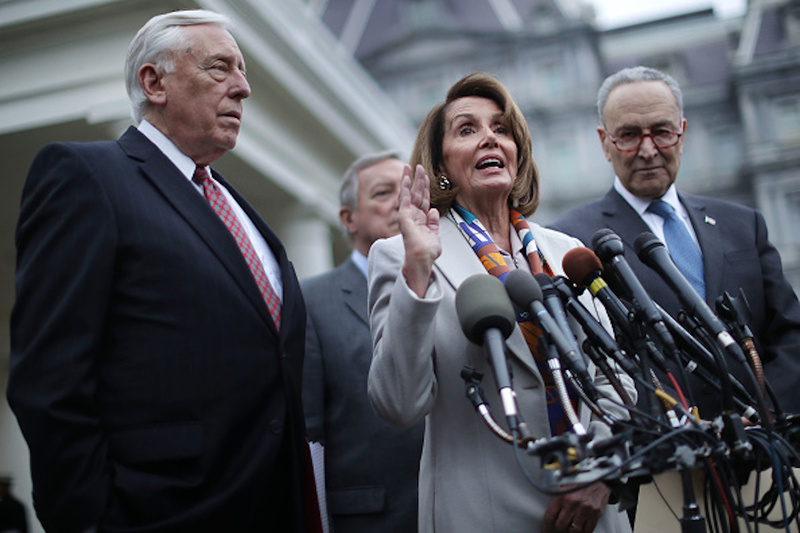 Pelosi told Trump in their last face-to-face encounter that she would not even negotiate over increased border barrier funding if he re-opened the government.